Will The Winner, Please Stand Up! The comments are now closed, and the winner has been chosen! I am SO glad I have the Random Number Generator! It would be too hard to choose otherwise. :) And, WOW! So many comments!!! And new followers!!! Hello new followers!!! :D Hope you are enjoying my blog – even if it’s just for the giveaways. ;) ha ha ha! Would #205 Please Stand Up!!! Everyone else should hurry on over to The Vintage Pearl and purchase a piece of jewelry of your own!!! Make sure and let her know Shealynn sent you. P.S. Come back on TUESDAY [yes… I am changing the day to Tuesday instead of Wednesdays from now on] for another GREAT giveaway! Funny – I just ordered 3 necklaces from her recently! They were shipped the other day. I am excitedly waiting for them. I saw the bartered necklace you got last year. I didn’t even know you were going to do a giveaway. I ordered one for me with my 5 kids’ names on it. I ordered one for my daughter with her initial and her boyfriend’s initial (she paid for half, the other half was a gift). 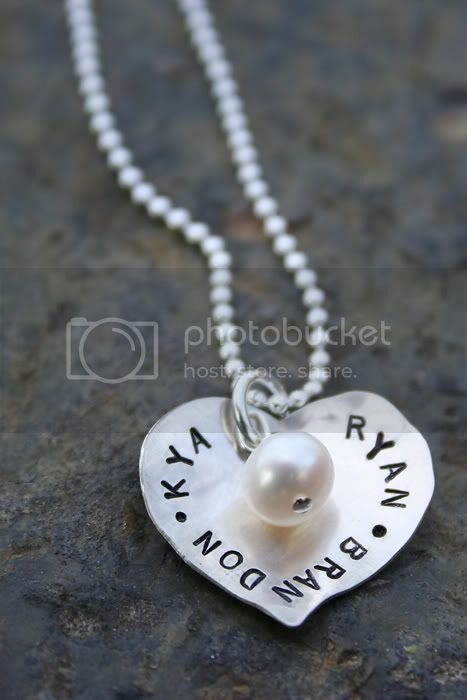 Then I ordered one for my son’s fiancee as a birthday gift with their names on it.